By Judy Haiven. 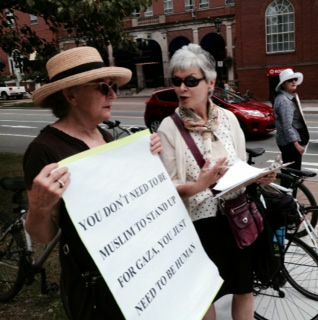 Judy is a member of Independent Jewish Voices- Canada and of Solidarity Halifax. She teaches at Saint Mary’s University in Halifax. Originally published at the Halifax Media Coop. It’s one block away from headquarters, but no one comes to see. It’s at midday, when – given that it’s glorious high summer – no one from headquarters drops by on their way to lunch on Spring Garden Road. It takes place on the busiest corner in Halifax, but no one from headquarters comes near because it could be controversial. The ‘no one’ is any journalist or reporter at the CBC Radio One headquarters. Dozens work there. We are told that there is the need for local content to shape the Information Morning show – 3 hours every weekday. There is also the one hour daily Maritime Noon program, and there is the 3 hour Main Street current affairs program broadcast in the afternoon, when Haligonians drive home from work. Oh I almost forgot, CBC Radio One also has to fill a local news spot every half hour for 12 hours a day – that’s 24 news spots. But not one reporter bothers to walk to the corner where we hold picket signs about stopping Israel’s destruction of Gaza. And still, the journalists at the CBC Radio soldier on reporting the business news, the stock market news, the charity swim news, the highway accident news, the grizzly murder and mayhem news –as though crime has not decreased to levels not seen since 1970. But there is no news on CBC Radio One about local people who are protesting Israel’s destruction of Gaza. Indeed, the news about 400 plus people in Halifax who stopped at the gates to the Public Gardens to sign letters to the Prime Minister — our local public broadcaster simply ignores. The Case: For the last 10 days from 12 noon to 12.30 pm, in front of the Public Gardens, members of Canadians, Arabs and Jews for a Just Peace, and Independent Jewish Voices-Canada have asked Haligonians and visitors to stop for a minute and sign a letter to PM Harper. The letter urges Harper to demand that Israel lift its 7 year blockade of Gaza and rebuild Gaza which Israeli troops attacked in their Operation Protective Edge. Israel has killed more than 2,000 civilians and maimed more than 10,000 people. More than 400,000 of Gazans (one quarter of their population) cannot go home because Israel has destroyed tens of thousands of houses in Gaza since early July. Kevin. He’s come to hold a sign and leaflet every day for 10 days. The Result: Fewer that 2% of people walking by the Public Gardens have refused to sign a letter to Harper. There is tremendous interest in halting Israel’s deployment of Hellfire missiles and shells on Gazan civilians. Even through short-lived recent ceasefires in effect, people in Halifax continued to demand that Israeli hospitals treat the 10,000 Palestinians burned and broken by Israel’s airstrikes. The letters to our PM also ask him to tell Israel to rebuild homes, mosques, hospitals and schools in Gaza, since Israel destroyed them. Today, at our media conference in front of the Public Gardens, there was no sign of reporters from the CBC – our public broadcaster. Maybe they are afraid of controversy. Maybe they don’t bother to open our emails and press releases. Maybe the reporters are simply too busy and too jaded to look at what hundreds of people in this city are doing for peace. 400 signed letters are a serious start.